Every year in February my wife, Lone, and I go to the small village of Furudal in Dalarne in Sweden for our winter vacation. 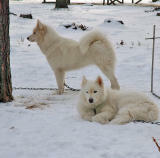 One of the goals is to compete in the Nordic Championships in sledding for Samoyed dogs. We live in a beautiful cabin village called Ore Fritidsby together with lots of other Samoyed fanciers. We spent two weeks there this year training, racing and having a good time with friends. This gallery shows some of the things we did and saw this year. Please feel free to leave a comment. Notice that this gallery has 2 pages. I really like the atmosphere of this gallary...Those dogs are really cute! excellent! Kommentarer ??? .... Gerne .... ÅH, hvor ser det dejligt ud. Heldigvis har vi jo været lidt mere sneberiget herhjemme end vanligt, og det ta'r den værste misundelse, men alligevel .... det ser dælme godt ud. Og Regitze serien er fuldstændig fantastisk. I am also a samoyed owner, but we live in Hong Kong. My dog will not have chance to see snow here. It's great that you share another type of life style of samoyeds ! We have a samoyed club in HK. It is our dream to bring our dogs to cold places and let them play in snow. Great Pictures Torben!!! Looks like you had some much fun!! !